Three months residency at Cemeti - Institute for Art and Society, Yogyakarta for a visual artist living and working in Germany focusing on social practice. Goethe-Institut Indonesia, in cooperation with Makassar Biennale Foundation, is inviting up to 30 participants to learn and exchange in person with museum experts from Germany, New Zealand, and Indonesia. 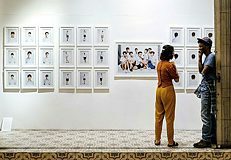 A photo exhibition on “Youth and Future” in Southeast Asia that will be shown in Frankfurt am Main and Berlin in 2019 after touring through various countries of the region. The eLibrary is the virtual library of the Goethe-Institut Jakarta for Indonesia.